Pictures of Sea Mammals, Steller Sea Lions, British Columbia. Sea Mammals - Steller Sea Lions - Eumetopias Jubatus, British Columbia. Although these sea mammals look helpless sitting on their rocky ledge, they can flee very quickly to the deeps of the ocean from any approaching danger. Normally quite flighty sea mammals, these sea lions seemed content to stay put long enough for this photo. 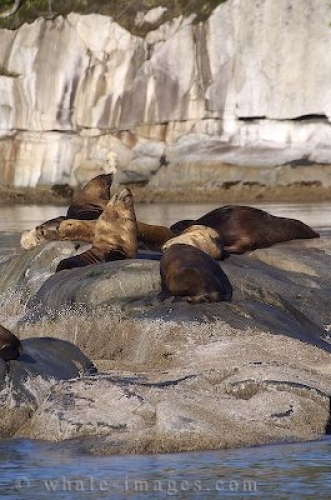 The steller sea lion has special hind flippers that can be pointed forward to give more maneuverability on land and can move quickly away from danger if threatened.